Calf-E is the Pulaski Yankees' lovable mascot. He was born prior to the 2015 season on a local farm in the New River Valley. He enjoys dancing, hanging out with fans, and posing for pictures. When he's not at Yankees' games at Calfee Park, you can find him out and about in the Pulaski community visiting schools, youth sporting events, and local organizations. The Pulaski Yankees Pinstripe Pals Kids Club presented by the Community Health Center of the New River Valley offers children a great way to experience Yankees baseball at Calfee Park! Open to kids 12 and under for just $15, membership in the Pinstripe Pals Kids Club includes a free ticket to each Monday night regular season Yankees home game during the 2019 season (five games), a Pinstripe Pals t-shirt, and an official Pinstripe Pals membership card. Additionally, all Pinstripe Pals will be invited to an ice cream party with Calf-E and Pulaski Yankees players during the 2019 season. The Pinstripe Pals Kids Club is presented by the Community Health Center of the New River Valley, a non-profit healthcare organization serving patients with or without insurance. To register your child for the Pinstripe Pals Kids Club presented by the Community Health Center of the New River Valley, click here (mail in) or click here (online). Parents can also purchase a Parent Pack to join their children for just $25 (five Monday tickets)! Want to donate a membership to a child in Big Brothers Big Sisters of Southwest Virginia? 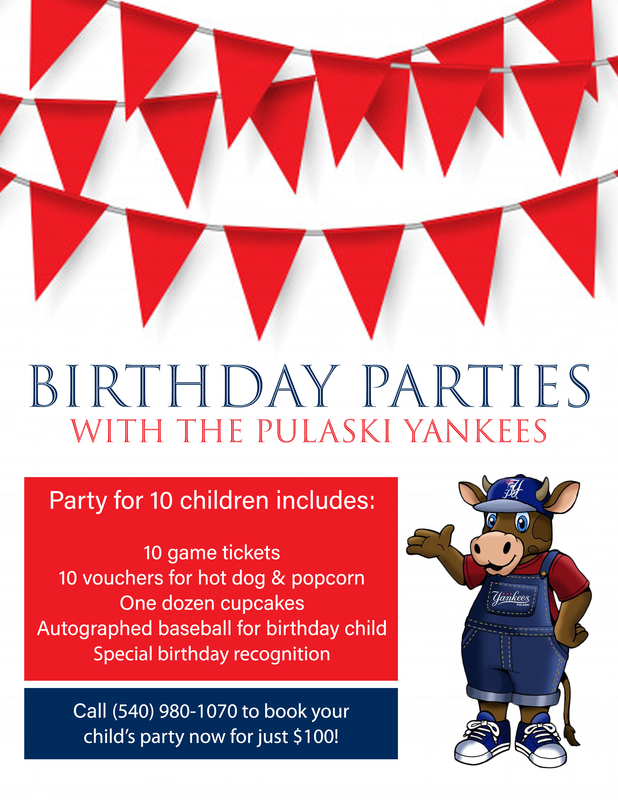 Call the Pulaski Yankees today at (540) 980-1070.